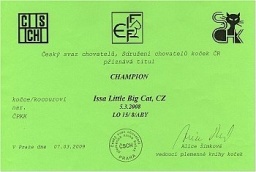 On February 28th and March 1st, 2009 we went with Issa to 7th and 8th international Freya Cat Show in Ústí nad Labem. After receiving three prices Issa is now a champion. With this show we are ending Issa’s cat show career, since she does not like it. On February 28th, 2009 we also went with Zeus to 7th international Freya Cat Show in Ústí nad Labem and he received his first Ex1 price like adolescent.